2014 registred an increase in thermal capacity producted by solar thermal collector of about 6.8% (over 2013): 188 MWth 7,000 m2 of collector area. 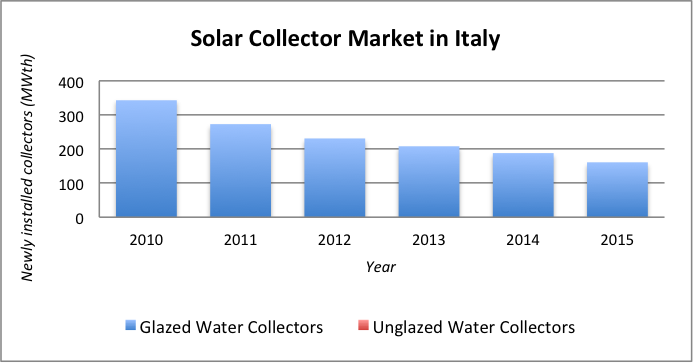 208 MWth of solar was added (297,000 m2 of collector area), but the annual market growth saw a decrese of 10%. The newly installed collectors increased the total installed capacity of glazed collectors (flat plates and evacuated tubes) to 2,805 MWth corrisponding to 4,006,000 m2 of collector area. On a per-capita basis, with 3 kWth per 1,000 inhabitants, Italy's market is in the middle zone of the countries covered in IEA SHC's annual statistic Solar Heat Worldwide. The most typical application is domestic hot water because it is mandatory for new buildings; typical products are flat plate and evacuated tube collectors. In recent years there has been an interest in solar cooling appilcations with absorbtion cooling machines both in the residential and industrial sector. Building regulations for energy efficiency support the adoption of solar thermal systems in new buildings. But the market for new construction performed weakly in recent years (0.5-0.7% growth p.a.). As a consequence the technology penetration remains low. Financial incentive schemes are more efficient in driving such transformation. The national tax deduction scheme has been active for several years and mainly addresses individuals. From 2013 the deduction increases to 65% OF THE INVESTMENT COSTS OVER 10 YEARS. It successfully supports energy efficiency and solar measures, in particular solar systems for DHW production. The "Conto Termico 2.0" or thermal account is dedicated to private and public users. It supports other renewable technologies: solar heating and cooling systems, installation of solar protection devices (including automation), heat pumps (including ground coupling) and biomass. The new version of this incentive, which started last year, has begun to give good results. The national industry essentially consists of installers and distributors, but there are several manufacturers of good quality products. System producer industries are present on the market and most of them are historically operating in the heating equipment sector. Average costs are between 600-800 € per square meter for small heating applications and 1,000-1,400 € for cooling application in small-medium buildings (without incentives). No specific actions exist on “solar buildings” and as a consequence, no buildings are rated as solar buildings. The energy rating of a building is given on the basis of an energy certification scheme, whichis based on the performance of the building (a function of both, solar and energy efficiency measures). Solar technologies for building applications fall under the wide concept of energy efficiency in buildings, with a special accent on “nearly zero energy buildings”, according to the framework set by relevant EU Directives. In this framework relevant technologies and topics are: solar cooling, low energy buildings, solar protection and district heating and cooling. According to the above section, no data and trend can be derived for the solar building market. National and local energy regulation are in force for new and renovated buildings in Italy. They fix performance targets mainly focused on space heating and domestic hot water consumption. Such regulation have a very limited impact on the penetration of solar buildings or solar technologies in energy efficient buildings. Current energy prices and consumer bills are not yet helping the market transformation. Financial incentive schemes are more efficient in driving such transformation. The national deduction tax scheme supports energy and solar measures, such as solar systems for DHW production and replacement of windows. The new version of "Conto termico", started last year, are expected to increase the spread of solar applications. The building sector is one of the most important engines of the national industry, and after a significant contraction of investment in the last years, in 2015 there was a slow trend inversion that gives hope for a recovery of the sector. No specific data about solar buildings can be extrapolated for the reasons explained above. Extra costs for high energy performance buildings (including energy efficiency and renewables integration) are between 10% to 30%, as a function of the investment effort for efficient and solar technology. R&D activities in solar heating and cooling technologies, including building integration and daylighting, are funded by the Ministry of the Economic Development within the Framework Program established with ENEA (Italian National Agency for New Technologies, Energy and Sustainable Economic Development), RSE (Ricerca sul Sistema energetico) and CNR (National Research Council) This is a broad program dealing with electricity generation, distribution and end use with a global budget of about 20M€. Specific actions are related to solar technologies at building and system levels, with a budget estimated around 3 M€. Information and technical reports produced over the years can be found at: www.enea.it/it/Ricerca_sviluppo/ricerca-di-sistema-elettrico www.ricercadisistema.it, www.rse-web.it, and www.ricercadisistema.cnr.it. Webpages and reports are in Italian. Some reports include the abstract in English. Other actions can be implemented at local levels, but there is not a national monitoring of such activities. Solar cooling for building application as well as solar high temperature for industrial process are gaining attention. Even if products are on the market, their penetration is not significant yet. Demonstration projects of solar cooling for various applications, such as greenhouses, are spreading with the aim to demostrate the high potential of this solar application in Italy and to increase the solar application market in various sectors. As in many European countries, the key to exploiting the solar thermal potential is based on the 20-20-20 Strategy. The strategy aims at: 20% reduction in EU greenhouse gas emissions from 1990 levels; 20% of EU energy consumption produced from renewable resources; 20% improvement in the EU's energy efficiency. The National Energy Efficiency Action Plan, issued every year by ENEA with the contribution of several stakeholders, stresses the relevance of the integration of renewable energies in the building sector to achieve national and EU targets. Local energy agencies are also established by local authorities at different territorial levels (Municipalities, Provinces, Regions). 65% reduction of the personal tax for budget invested in the implementation of energy efficiency measures in existing building. The scheme started in 2008 with an impressive growth in applications, and it is considered by the industry as a major measure in these economically depressed phases. The schemes support energy efficiency measures, as well as the installation of solar thermal systems. Conto Termico 2.0 is a scheme started in early 2013 that supports the adoption of energy efficiency and solar technologies for individuals and public buildings. Also innovative solutions, like solar cooling and ground coupled heat pumps, are funded within the scheme. Calls for energy efficiency and renewable integration in buildings are published by the Ministry of Environment, Ministry of Economic Development and local authorities based on availability of funds. Specific funds are dedicated to the depressed area of southern Italy. No Italian associations exist, but there are national branches of international organization for energy environmental buildings, such as IISBE and LEED.